The POS-X XM95 3-Track Magnetic Swipe Reader (MSR) is the universal choice for reading magnetically encoded cards. Featuring Plug'n'Play USB and Keyboard wedge (PS/2) interfaces, the XM95 is ready to go out of the box. Smooth Bi-directional operation ensures a high success rate with every swipe. 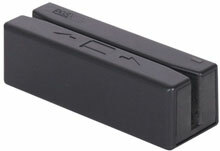 Fairly simple card reader that gets the job done without costing a fortune.